Here at Prime Time Fantasy Football we always look to model ourselves after successful franchises. When we saw how well batting something away worked for the Seahawks, we thought we would try the same thing with Kevin. 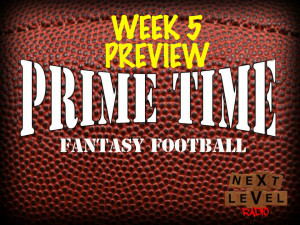 It worked out for us as well, as Ryan filled in admirably to help us preview week 5. Our listener question this week has to do with a quarterback fill-in, so be sure to listen to that if your signal caller is on a bye or got hurt. We’re also going to cover every game’s fantasy relevant issues this week; 13 games in all. Topics will include Peyton Manning, a few backfield controversies, and who you should be looking to pick up if you’re having a wide receiver crisis. And we’ll close as we always do with some Show Me the Money and a Fantasy Fact of the Week.